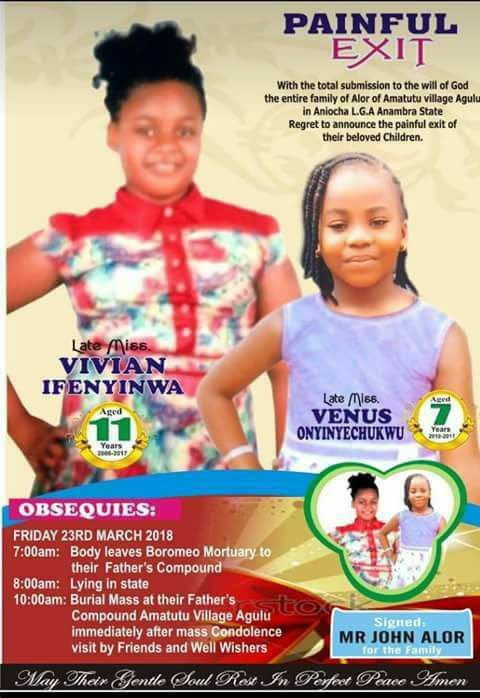 Two innocent sisters, Vivian Ifenyinwa and Venus Onyinyechukwu will be buried tomorrow, Friday 23rd March, 2018 at their father's compound in Amatutu village, Agulu area of Anambra State. A friend who shared the sad story, Nnamdi Ezewuzie revealed that the sisters were killed by bullets from the gun of armed robbers. He wrote: "Painful! Quite painful!! Innocent Vivian and Venus fell by the robbers' bullets in Onitsha in Anambra State last December immediately after Xmas home coming from Lagos to celebrate the season with grandma. The mum is my 'nwadiana'. May your tender souls find a good repose in the bosom of the Most High as you go down the grave tomorrow. "